Daniel D. Talley’s newly released “Note 2 Self: Faithful Inspiration and Aspiration” is a powerful collection of aphorisms for self-reflection and maturing in faith. “Note 2 Self: Faithful Inspiration and Aspiration” from Christian Faith Publishing author Daniel D. Talley is a compelling book of short, punchy insights and nuggets of wisdom that draws the reader to self-awareness and reassessment of their standing with God at any stage of their lives, while cutting to the core of what it is to actively and authentically live the Christian faith, offering these “poor man’s proverbs” as invaluable food for the spirit as well as a self-measuring stick. “Note 2 Self: Faithful Inspiration and Aspiration”: a discerning book of inspiring aphorisms. “Note 2 Self” is the creation of published author Daniel D. Talley, a native of Detroit, MI, and a US Air Force veteran. Daniel accepted Jesus as his Lord and Savior while stationed in the UK in 1986. Talley is a married father of two residing in North Carolina. Talley writes, “Every once in a while, a book comes a long that inspires, encourages, motivates, and makes you laugh. ‘Note 2 Self: Faithful Inspiration and Aspiration’ is thought-provoking and challenges you to determine where you are in your relationship with God through a series of entries the author calls poor man’s proverbs. Take notes as you read through the book, pondering where you are in your life with the inspiring goal of ultimately drawing closer to your aspirations. It offers helpful hints on how to accomplish this objective. You will find yourself saying ‘Hmm…’ quite a bit. Published by Christian Faith Publishing, Daniel D. Talley’s new book is a glowing testament and legacy to the urgent need for God’s power in society and in personal everyday life. The book provides ample lined space on every page for readers to include their own insights and notes to self during their reading as the Spirit moves them. View a synopsis of “Note 2 Self: Faithful Inspiration and Aspiration” on YouTube. 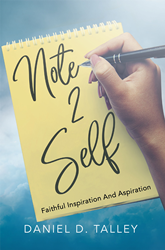 Consumers can purchase “Note 2 Self: Faithful Inspiration and Aspiration” at traditional brick & mortar bookstores, or online at Amazon.com, Apple iTunes store, or Barnes and Noble. For additional information or inquiries about “Note 2 Self: Faithful Inspiration and Aspiration”, contact the Christian Faith Publishing media department at 866-554-0919.